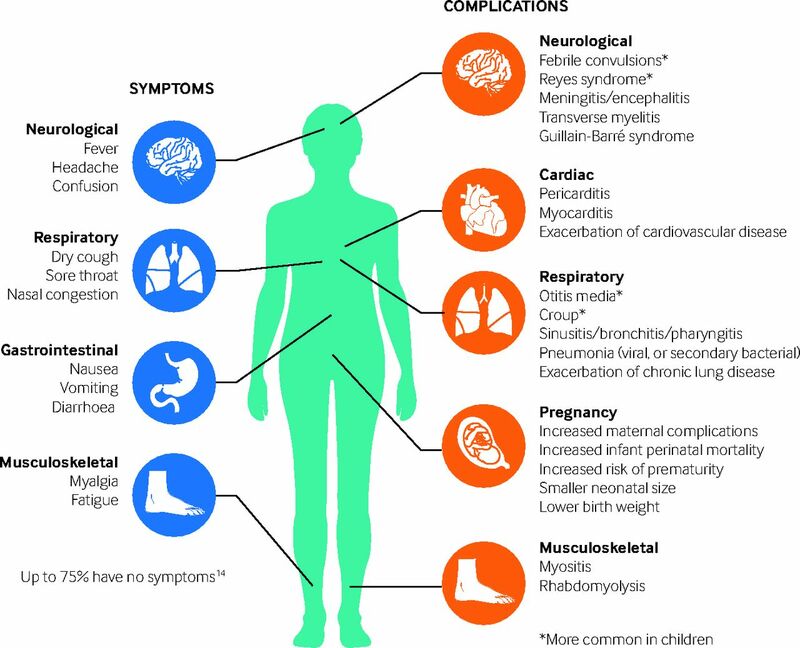 The World Health Organisation estimates that approximately one billion people are infected and up to 500 000 people die from influenza each year.1 The greatest burden of illness usually occurs among children, while the highest burden of severe disease (in terms of hospitalisation and death) occurs in those with underlying medical conditions, infants and young children, and elderly people.2 Current circulating influenza strains in humans include influenza A(H1N1)pdm09, influenza A(H3N2), and both influenza B viruses (B/Victoria and B/Yamagata).3 4 This article provides non-specialists with information on how to diagnose, manage, and prevent flu. How do influenza epidemics and pandemics occur? In contrast, pandemics (severe global epidemics) of influenza occur when a new influenza A subtype emerges abruptly because of a major shift in the proteins on the virus surface (antigenic shift), often because of combination with viruses circulating in animals.26 As most people have no immunity to the new subtype, infection spreads quickly (table 2⇓). Most influenza is diagnosed clinically in the community at times when the virus is known to be circulating. Patients admitted to hospital may have respiratory samples taken for testing by polymerase chain reaction (PCR), rapid antigen test, or immunofluorescence assay. With respiratory outbreaks in a closed setting (such as care homes, schools, hospitals) nasal swabs may be taken from the first few symptomatic individuals to identify the responsible organism. What treatments are available for influenza? Individuals with complicated influenza may be helped by antiviral treatment.21 22 Treatment is most effective if started within 48 hours of symptom onset, and it should not be delayed while awaiting results of investigations.12 28 Neuraminidase inhibitors oseltamivir and zanamivir inhibit viral release from infected cells and reduce the rate of viral replication. Meta-analysis of individual participant data found that, compared with late treatment, early treatment (within 48 hours of symptom onset) of hospitalised individuals with complicated influenza reduced the odds of mortality by 52%.28 Some individuals may require antibiotic therapy to treat secondary bacterial infections. *Children <6 months old are not eligible to receive influenza vaccines and should be protected against influenza through vaccination of their mother during pregnancy. Have not received vaccination in the current influenza season, or who have been vaccinated <14 days since contact or where there is significant mismatch between vaccine and circulating strains, or during an outbreak in a closed setting regardless of vaccination history. Although published evidence for effectiveness is limited, hand and cough hygiene are likely to be important interventions to reduce influenza spread in the community, as well as in closed settings (table 3⇓). During an outbreak, consider isolation of residents of closed settings for the duration of the infectious period (five days after symptom onset) to limit spread to others. Cohorting of patients (that is, in separate hospital bays or on separate floors of a residential home) may be necessary. Residential homes may need to be closed to new admissions until the outbreak is controlled. Care must be taken when discharging a patient from a ward with a known influenza outbreak to a care home, or vice versa. We searched PubMed and the Cochrane Library databases (search terms “influenza,” “flu,” “influenza-like illness”). We obtained information on the epidemiology of influenza from annual reports produced by authoritative bodies and organisations such as Public Health England (PHE), Centers for Communicable Disease Prevention and Control (CDC), and the World Health Organization (WHO). We reviewed up-to-date influenza guidelines and reviews, including those published by PHE, Cochrane Reviews, and the National Institute for Health and Care Excellence (NICE). What steps have you taken to improve the uptake of influenza vaccination among staff and eligible patients under your care? Have you reviewed your organisation’s infection control policy for responding to an outbreak of influenza-like illness? Have you reviewed antivirals prescribed (treatment or prophylaxis) for eligible patients with influenza and their close contacts? Contributors: SG and PM conceived of the review. SG is the guarantor of the manuscript. SG, PM, and AH undertook the literature review, and were supported by Dr Bethan Roberts, foundation year 2 trainee in health protection, Cheshire and Merseyside Health Protection Team, Public Health England North West. SG, PM, and AH contributed to writing drafts of the manuscript. PM designed and wrote code for the interactive application. All authors have seen and approved the final manuscript version. World Health Organization. Influenza (seasonal)—Fact sheet No 211. 2014. www.who.int/mediacentre/factsheets/fs211/en/. Cromer D, van Hoek AJ, Jit M, Edmunds WJ, Fleming D, Miller E. The burden of influenza in England by age and clinical risk group: a statistical analysis to inform vaccine policy. J Infect2014;68:363-71. doi:10.1016/j.jinf.2013.11.013 pmid:24291062. World Health Organization. Global Influenza Surveillance and Response System (GISRS). 2016. www.who.int/influenza/gisrs_laboratory/en/. World Health Organization. Influenza vaccine viruses and reagents. 2016. www.who.int/influenza/vaccines/virus/en/. Ferguson L, Eckard L, Epperson WB, et al. Influenza D virus infection in Mississippi beef cattle. Virology2015;486:28-34. doi:10.1016/j.virol.2015.08.030 pmid:26386554. Hause BM, Collin EA, Liu R, et al. Characterization of a novel influenza virus in cattle and Swine: proposal for a new genus in the Orthomyxoviridae family. MBio2014;5:e00031-14. doi:10.1128/mBio.00031-14 pmid:24595369. A revision of the system of nomenclature for influenza viruses: a WHO memorandum. Bull World Health Organ1980;58:585-91.pmid:6969132. Webster RG, Bean WJ, Gorman OT, Chambers TM, Kawaoka Y. Evolution and ecology of influenza A viruses. Microbiol Rev1992;56:152-79.pmid:1579108. Olson DR, Heffernan RT, Paladini M, Konty K, Weiss D, Mostashari F. Monitoring the impact of influenza by age: emergency department fever and respiratory complaint surveillance in New York City. PLoS Med2007;4:e247. doi:10.1371/journal.pmed.0040247 pmid:17683196. Kawai S, Nanri S, Ban E, et al. Influenza vaccination of schoolchildren and influenza outbreaks in a school. Clin Infect Dis2011;53:130-6. doi:10.1093/cid/cir336 pmid:21690619. Matsuzaki Y, Sugawara K, Furuse Y, et al. Genetic Lineage and Reassortment of Influenza C Viruses Circulating between 1947 and 2014. J Virol2016;90:8251-65. doi:10.1128/JVI.00969-16 pmid:27384661. Public Health England. PHE guidance on use of antiviral agents for the treatment and prophylaxis of seasonal influenza. Version 7.0. PHE, 2016. Lam PP, Coleman BL, Green K, et al. Predictors of influenza among older adults in the emergency department. BMC Infect Dis2016;16:615. doi:10.1186/s12879-016-1966-4 pmid:27793117. Monto AS, Gravenstein S, Elliott M, Colopy M, Schweinle J. Clinical signs and symptoms predicting influenza infection. Arch Intern Med2000;160:3243-7. doi:10.1001/archinte.160.21.3243 pmid:11088084. Ohmit SE, Monto AS. Symptomatic predictors of influenza virus positivity in children during the influenza season. Clin Infect Dis2006;43:564-8. doi:10.1086/506352 pmid:16886147. Minodier L, Charrel RN, Ceccaldi PE, et al. Prevalence of gastrointestinal symptoms in patients with influenza, clinical significance, and pathophysiology of human influenza viruses in faecal samples: what do we know?Virol J2015;12:215. doi:10.1186/s12985-015-0448-4 pmid:26651485. Lessler J, Reich NG, Brookmeyer R, Perl TM, Nelson KE, Cummings DA. Incubation periods of acute respiratory viral infections: a systematic review. Lancet Infect Dis2009;9:291-300. doi:10.1016/S1473-3099(09)70069-6 pmid:19393959. Department of Health. Routes of transmission of the influenza virus: scientific evidence base review. DoH, 2011. Killingley B, Greatorex J, Digard P, et al. The environmental deposition of influenza virus from patients infected with influenza A(H1N1)pdm09: Implications for infection prevention and control. J Infect Public Health2016;9:278-88. doi:10.1016/j.jiph.2015.10.009 pmid:26653976. Lau LLH, Cowling BJ, Fang VJ, et al. Viral shedding and clinical illness in naturally acquired influenza virus infections. J Infect Dis2010;201:1509-16. doi:10.1086/652241 pmid:20377412. National Institute for Health and Care Excellence. Clinical Knowledge Summaries: Influenza-seasonal. 2015. https://cks.nice.org.uk/influenza-seasonal. National Institute for Health and Care Excellence. Amantadine, oseltamivir and zanamivir for the treatment of influenza (technology appraisal guidance 168). 2009. www.nice.org.uk/Guidance/ta168. Viboud C, Alonso WJ, Simonsen L. Influenza in tropical regions. PLoS Med2006;3:e89. doi:10.1371/journal.pmed.0030089 pmid:16509764. Moura FE. Influenza in the tropics. Curr Opin Infect Dis2010;23:415-20. doi:10.1097/QCO.0b013e32833cc955 pmid:20644472. World Health Organization. Pandemic influenza preparedness and response. WHO, 2010. Jefferson T, Jones MA, Doshi P, et al. Neuraminidase inhibitors for preventing and treating influenza in healthy adults and children. Cochrane Database Syst Rev2014;4:CD008965.pmid:24718923. Muthuri SG, Venkatesan S, Myles PR, et al. PRIDE Consortium Investigators. Effectiveness of neuraminidase inhibitors in reducing mortality in patients admitted to hospital with influenza A H1N1pdm09 virus infection: a meta-analysis of individual participant data. Lancet Respir Med2014;2:395-404. doi:10.1016/S2213-2600(14)70041-4 pmid:24815805. Zambon M. Developments in the treatment of severe influenza: lessons from the pandemic of 2009 and new prospects for therapy. Curr Opin Infect Dis2014;27:560-5. doi:10.1097/QCO.0000000000000113 pmid:25333476. Dobson J, Whitley RJ, Pocock S, Monto AS. Oseltamivir treatment for influenza in adults: a meta-analysis of randomised controlled trials. Lancet2015;385:1729-37. doi:10.1016/S0140-6736(14)62449-1 pmid:25640810. Department of Health. Chief Medical Officer and Chief Pharmaceutical Officer: advice on using antiviral medicines: influenza season 2015 to 2016. DoH, 2016. World Health Organization. WHO Guidelines for pharmacological management of pandemic influenza A(H1N1) 2009 and other influenza viruses. WHO, 2010. Demicheli V, Jefferson T, Al-Ansary LA, Ferroni E, Rivetti A, Di Pietrantonj C. Vaccines for preventing influenza in healthy adults. Cochrane Database Syst Rev2014;3:CD001269.pmid:24623315. Kliner M, Keenan A, Sinclair D, Ghebrehewet S, Garner P. Influenza vaccination for healthcare workers in the UK: appraisal of systematic reviews and policy options. BMJ Open2016;6:e012149. doi:10.1136/bmjopen-2016-012149 pmid:27625062. Beran J, Peeters M, Dewé W, Raupachová J, Hobzová L, Devaster JM. Immunogenicity and safety of quadrivalent versus trivalent inactivated influenza vaccine: a randomized, controlled trial in adults. BMC Infect Dis2013;13:224. doi:10.1186/1471-2334-13-224 pmid:23688546. Kieninger D, Sheldon E, Lin WY, et al. Immunogenicity, reactogenicity and safety of an inactivated quadrivalent influenza vaccine candidate versus inactivated trivalent influenza vaccine: a phase III, randomized trial in adults aged ≥18 years. BMC Infect Dis2013;13:343. doi:10.1186/1471-2334-13-343 pmid:23883186. Pépin S, Donazzolo Y, Jambrecina A, Salamand C, Saville M. Safety and immunogenicity of a quadrivalent inactivated influenza vaccine in adults. Vaccine2013;31:5572-8. doi:10.1016/j.vaccine.2013.08.069 pmid:24016810. Tinoco JC, Pavia-Ruz N, Cruz-Valdez A, et al. Immunogenicity, reactogenicity, and safety of inactivated quadrivalent influenza vaccine candidate versus inactivated trivalent influenza vaccine in healthy adults aged ≥18 years: a phase III, randomized trial. Vaccine2014;32:1480-7. doi:10.1016/j.vaccine.2014.01.022 pmid:24486352. Baguelin M, Flasche S, Camacho A, Demiris N, Miller E, Edmunds WJ. Assessing optimal target populations for influenza vaccination programmes: an evidence synthesis and modelling study. PLoS Med2013;10:e1001527. doi:10.1371/journal.pmed.1001527 pmid:24115913. Loeb M, Russell ML, Moss L, et al. Effect of influenza vaccination of children on infection rates in Hutterite communities: a randomized trial. JAMA2010;303:943-50. doi:10.1001/jama.2010.250 pmid:20215608. Belshe RB, Edwards KM, Vesikari T, et al. CAIV-T Comparative Efficacy Study Group. Live attenuated versus inactivated influenza vaccine in infants and young children. N Engl J Med2007;356:685-96. doi:10.1056/NEJMoa065368 pmid:17301299. Fleming DM, Crovari P, Wahn U, et al. CAIV-T Asthma Study Group. Comparison of the efficacy and safety of live attenuated cold-adapted influenza vaccine, trivalent, with trivalent inactivated influenza virus vaccine in children and adolescents with asthma. Pediatr Infect Dis J2006;25:860-9. doi:10.1097/01.inf.0000237797.14283.cf pmid:17006278. Ambrose CS, Luke C, Coelingh K. Current status of live attenuated influenza vaccine in the United States for seasonal and pandemic influenza. Influenza Other Respir Viruses2008;2:193-202. doi:10.1111/j.1750-2659.2008.00056.x pmid:19453395. Englund JA, Mbawuike IN, Hammill H, Holleman MC, Baxter BD, Glezen WP. Maternal immunization with influenza or tetanus toxoid vaccine for passive antibody protection in young infants. J Infect Dis1993;168:647-56. doi:10.1093/infdis/168.3.647 pmid:8354906. Zaman K, Roy E, Arifeen SE, et al. Effectiveness of maternal influenza immunization in mothers and infants. N Engl J Med2008;359:1555-64. doi:10.1056/NEJMoa0708630 pmid:18799552. Naleway AL, Irving SA, Henninger ML, et al. Vaccine Safety Datalink and Pregnancy and Influenza Project. Safety of influenza vaccination during pregnancy: a review of subsequent maternal obstetric events and findings from two recent cohort studies. Vaccine2014;32:3122-7. doi:10.1016/j.vaccine.2014.04.021 pmid:24742490. Tamma PD, Ault KA, del Rio C, Steinhoff MC, Halsey NA, Omer SB. Safety of influenza vaccination during pregnancy. Am J Obstet Gynecol2009;201:547-52. doi:10.1016/j.ajog.2009.09.034 pmid:19850275. National Institute for Health and Care Excellence. Oseltamivir, amantadine and zanamivir for the prophylaxis of influenza (technology appraisal guidance 158). 2008. www.nice.org.uk/guidance/ta158. Public Health England. Infection control precautions to minimise transmission of respiratory tract infections (RTIs) in the healthcare setting. PHE, 2014. Siegel J, Rhinehart E, Jackson M, Centers for Disease Control and Prevention. Guideline for isolation precautions: preventing transmission of infectious agents in healthcare settings. CDC, 2007. Health and Safety Executive. Pandemic flu—workplace guidance. HSE, 2016. European Centre for Disease Prevention and Control (ECDC). Technical document. Safe use of personal protective equipment in the treatment of infectious diseases of high consequence: A tutorial for trainers in healthcare settings. Version 2, 2014. Public Health England. PHE guidelines on the management of outbreaks of influenza-like illness in care homes. 2016. www.gov.uk/government/publications/acute-respiratory-disease-managing-outbreaks-in-care-homes. Public Health England. Managing outbreaks of acute respiratory disease in care homes. 2012 (and supplement 2014). www.gov.uk/government/publications/acute-respiratory-disease-managing-outbreaks-in-care-homes. Impagliazzo A, Milder F, Kuipers H, et al. A stable trimeric influenza hemagglutinin stem as a broadly protective immunogen. Science2015;349:1301-6. doi:10.1126/science.aac7263 pmid:26303961. Yassine HM, Boyington JC, McTamney PM, et al. Hemagglutinin-stem nanoparticles generate heterosubtypic influenza protection. Nat Med2015;21:1065-70. doi:10.1038/nm.3927 pmid:26301691. Joyce MG, Wheatley AK, Thomas PV, et al. NISC Comparative Sequencing Program. Vaccine-induced antibodies that neutralize group 1 and group 2 influenza A viruses. Cell2016;166:609-23. doi:10.1016/j.cell.2016.06.043 pmid:27453470. Furuta Y, Gowen BB, Takahashi K, Shiraki K, Smee DF, Barnard DL. Favipiravir (T-705), a novel viral RNA polymerase inhibitor. Antiviral Res2013;100:446-54. doi:10.1016/j.antiviral.2013.09.015 pmid:24084488. Rossignol JF, La Frazia S, Chiappa L, Ciucci A, Santoro MG. Thiazolides, a new class of anti-influenza molecules targeting viral hemagglutinin at the post-translational level. J Biol Chem2009;284:29798-808. doi:10.1074/jbc.M109.029470 pmid:19638339. Haffizulla J, Hartman A, Hoppers M, et al. US Nitazoxanide Influenza Clinical Study Group. Effect of nitazoxanide in adults and adolescents with acute uncomplicated influenza: a double-blind, randomised, placebo-controlled, phase 2b/3 trial. Lancet Infect Dis2014;14:609-18. doi:10.1016/S1473-3099(14)70717-0 pmid:24852376. Leneva IA, Russell RJ, Boriskin YS, Hay AJ. Characteristics of arbidol-resistant mutants of influenza virus: implications for the mechanism of anti-influenza action of arbidol. Antiviral Res2009;81:132-40. doi:10.1016/j.antiviral.2008.10.009 pmid:19028526. Pécheur EI, Borisevich V, Halfmann P, et al. The synthetic antiviral drug arbidol inhibits globally prevalent pathogenic viruses. J Virol2016;90:3086-92. doi:10.1128/JVI.02077-15 pmid:26739045.